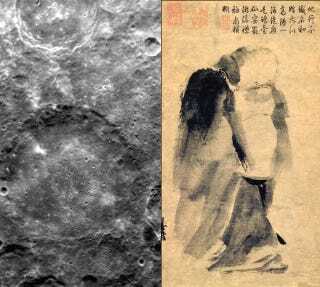 A crater on Mercury bares the name of Liang Kai, a human painter from China's Southern Song Dynasty. While Kai is from hundreds of years ago, living 1140 to 1210 CE, substantial erosion and infilling indicates his crater is much older. Liang Kai went by the nickname Madman Liang, although I doubt that was by his choosing. He was a minimalistic painter, using the least number of brush strokes to evoke the subjects of his paintings. One of his most famous paintings is the Drunken Celestial, of a sage wandering in a drunken stupor. Liang Kai crater is in the center-left of the image, an enormous 140 kilometer diameter. The low, indistinct rim and shallow floor are from constant erosion by micro (and not-so-micro) impacts, and infill by sediment from the surrounding plains. Lian Kai isn't the only artist name-checked in this batch of craters. The bright crater at the top with the scattering of brightly-reflecting central peaks is Gainsborough, named for the English landscape and portrait painter Thomas Gainsborough. The image was captured by the Mercury Dual Imaging System on the Messenger probe, part of an effort to develop a high-resolution albedo base map. Albedo is the surface brightness, so the best images are when the Sun is overhead. The average resolution is 200 meters per pixel. Image Credit: NASA/Johns Hopkins University Applied Physics Laboratory/Carnegie Institution of Washington. For more craters, the Lunar Reconnoissance Orbiter has a beautiful batch of images taken with a variety of instruments.